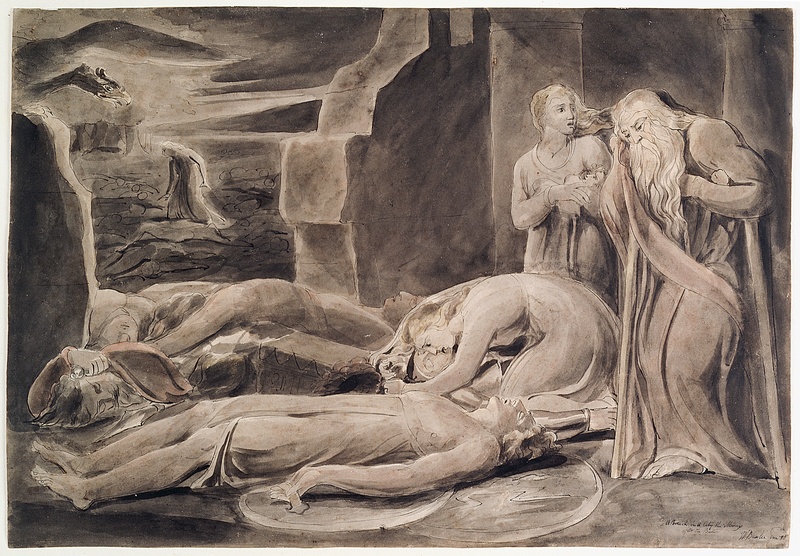 In 1784, William Blake exhibited works at the Royal Academy entitled A Breach in a City the Morning after the Battle and War Unchained by an Angel. 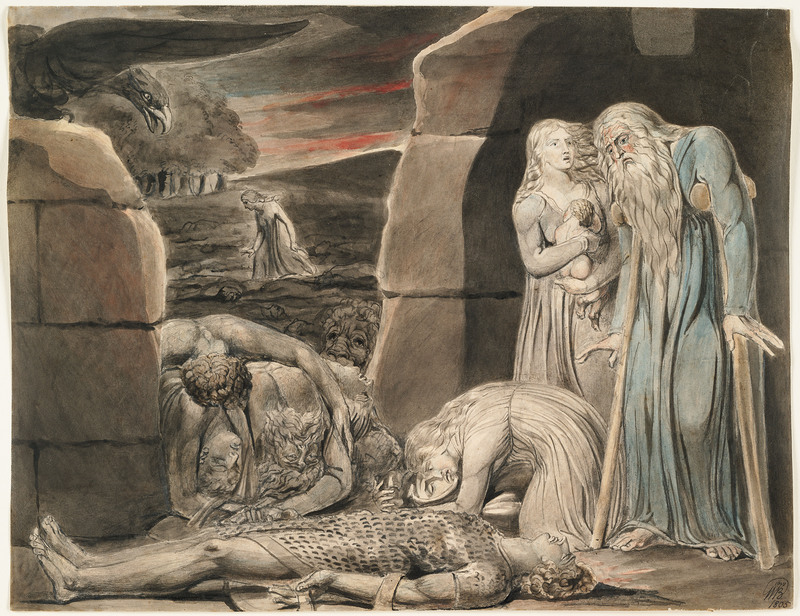 Fire, Pestilence, and Famine Following (Butlin, The Paintings and Drawings of William Blake 187, hereafter referred to as Butlin; numbers are catalogue entries). *↤ I am grateful to Martin Butlin and Robert N. Essick for reading early drafts of this article and for their many helpful suggestions. The latter work, which may have been paired causally with A Breach, is lost, and the identity of the former is a matter of debate. Some critics assume that the version exhibited is either the one now in the Ackland Museum of Art (Robertson 175; Blunt 11n27) or the one in the Carnegie Museum of Art (Cummings 160, Rosenblum 154n27), while others believe that it too is lost and that the Carnegie and Ackland versions are c. 1790-95 and c. 1795-1800 respectively (Pressly 138-39; Butlin 188). In this study, I argue that there are strong technical and aesthetic reasons to believe that the drawing in the Ackland Museum is both the second version and the one exhibited in 1784, and that the first two versions of Pestilence are also incorrectly dated. My intention, though, is not only to argue that Robertson and Blunt were correct about the Ackland version of A Breach, but also to examine why and how the same artifact can appear to one art historian to have been produced c. 1784 and to another as late as 1800. While disagreement about dates is not unprecedented in Blake studies, this one is unusually pronounced and raises serious questions about the assumptions and kinds of evidence (e.g., historical documents, techniques, materials, styles, and themes) used to date these and other Blake designs. Indeed, by redating versions of A Breach, I am not only redating versions of Pestilence but am also challenging currently accepted ideas of Blake’s pictorial style and development in the 1780s and 1790s. Furthermore, the inconsistencies in the hypotheses used to date and sequence the versions of A Breach and Pestilence require our rethinking the date and place of a particular sketch (illus. 12) in the evolution of Pestilence—which, in turn, questions Blake’s use and understanding of sketching in general. The extant versions of Blake’s A Breach in a City the Morning after the Battle are in the Carnegie Museum (illus. 1), the Ackland Museum (illus. 2), and the Fogg Art Museum (illus. 3), though we know this last version as War. These three watercolors are dated c. 1790-95, c. 1795-1800, and 1805, respectively (Butlin 189, 191, 195). They appear to have been executed or at least paired with versions of Pestilence, which are in the collections of the late Gregory Bateson (on loan to the Ackland Museum) (illus. 13), the Bristol Museum and Art Gallery (illus. 14), and the Boston Museum of Fine Arts (illus. 15; Butlin 190, 192, 193). A Breach and Pestilence were first described in Alexander Gilchrist’s Life of Blake (1863), but the descriptions are the source of much subsequent confusion. Gilchrist was unaware that there was more than one version of A Breach. From the 1784 Royal Academy exhibition catalogue, he knew of the exhibited version and of War Unchained, but he had seen neither work (1: 54). He identifies the theme of both as “the supreme despicableness of War” and claims that they “gave birth about twenty years later to four very fine water-colour drawings, . . . Fire, Plague, Pestilence, and Famine” (1: 54). By “Pestilence” Gilchrist apparently means Pestilence: The Death of the First Born (Butlin 442), because he had titled the c. 1805 version of Pestilence (illus. 15) as “Plague” and had it reproduced as a wood-engraving by W. J. Linton and inserted to face page 54.1↤ 1 The c. 1805 version of Pestilence was acquired by J. C. Strange from Thomas Butts, Jr. at Foster’s on 29 June 1853 (lot #131). Gilchrist apparently borrowed the work from Strange for W. J. Linton to reproduce. Gilchrist’s mistitling suggests that he was also unaware that there was more than this one version of Pestilence, since both early versions were so titled by Blake (illus. 13, 14). In 1862, a year after Gilchrist died and a year before the Life of Blake was published, William Michael Rossetti, using Gilchrist’s lists and those of William Haines, began to compile for the Life the first catalogue raisonné of Blake’s drawings and paintings.2↤ 2 The catalogue is included in the second volume of the Life (199-268) and is here referred to as Rossetti, followed by page and catalogue numbers. Like Gilchrist, Rossetti had seen neither War Unchained nor the two early versions of Pestilence, though he had examined the sketch (241, #18).3↤ 3 Rossetti was thought to have examined the Bristol version of Pestilence, but Butlin’s provenance (192) is actually that of the sketch (see Essick, Works 118; Bennett 136, 138), while the Bristol version itself “remains without a provenance until the sale of works from the collection of Henry Willet at Christie’s on 10 April 1904” (Butlin “Footnotes” 17). Rossetti’s unawareness of the Bateson version of Pestilence is troubling, since it was sold at Sotheby’s on 29 April 1862, supposedly by Frederick Tatham. He is identified as the vendor to this anonymous sale because of the number of Blake works sold (over 200 items) and the preponderance of sketches, the kind of work Tatham inherited through Mrs. Blake. That Rossetti was corresponding with Tatham at this time but unaware of the sale (the works from the sale that he records were known to him through their new owners, like Harvey, Palser, and Palgrave, and not from the sale or its catalogue) raises the possibility that the vendor was someone other than Tatham, and/or that someone was purchasing works from Mrs. Blake between 1827 and 1831. Unlike Gilchrist, he had also examined the Carnegie version of A Breach, which had sold in “Mr. [Elhanan] Bicknell’s Sale, [May] 1863” as “The Plague,” a title that Rossetti recognized was “decidedly a mistake,” since that was what Gilchrist and he called the c. 1805 version of Pestilence (207, #55). Rossetti apparently identified the Bicknell/Carnegie drawing as A Breach, the work exhibited in the Royal Academy in 1784 (201, #5), on the basis of its subject—a breached city wall filled with dead soldiers and mourners—since the work itself was not inscribed or titled or in any other way identified by Blake. Like Gilchrist, Rossetti was unaware that there was more than one version of A Breach, Bicknell’s version being the only one that he actually examined. He knew of the Fogg version, but he knew it as War and appears not to have realized that it was a version of A Breach. He knew of War because it was “mentioned” by that title “in the account” (209, #68), by which he means Thomas Butts’s account of 12 May 1805 (Life 2: 256; see Bentley, Blake Records 572). But Rossetti lists War twice, implying that there were two works so titled. The second he records as belonging to a “Mr. Fuller” (238, #227), whose Blake collection of nine watercolors he knew only through an 1852 Sotheby’s sale catalogue.4↤ 4 Fuller was probably Joseph or Samuel Fuller, print dealers in London from 1808 to 1862. He bought his Blake watercolors on 26 June 1852 at Sotheby’s. For an examination of this auction, its vendors, and the Blake works sold, see my “Blake and the Marketplace 1852.” By 1876, War belonged to J. F. Hall, who lent it to the Burlington Fine Arts Club exhibition. One assumes that Rossetti saw it at that time, since he reviewed the exhibition for Academy (9 : 364-65). In his revised 1880 lists, he continues to record it as War, the work “mentioned in the account” (216, #75), but deletes the second reference because he comes to believe that Fuller’s War is War Unchained of 1784.5↤ 5 In his annotated copy, Rossetti writes next to Fuller’s War. “So far as one can surmise, may be the same as No 4,” by which he means War Unchained. Next to #4 he writes “Mr. Fuller from Mr. Butts,” which in the 1880 lists is shortened to “Butts,” because Butts and Linnell are the only owners recorded in the second edition. Rossetti’s annotated copy of the Life is in the Houghton Library, Harvard University, annotated supposedly between 1868 and 1876 (see Wittreich and Butlin, “Annotations”). But Rossetti appears to have begun making notes very soon after publication of the Life. In a letter of 6 November 1863, Anne Gilchrist refers to Rossetti’s “annotations to the Blake,” which were, Rossetti explained, “certain pencillings I had made in my copy of Gilchrist’s Life of Blake, which was by this time already published” (Rossetti Papers 41, 40). More confusing still, Rossetti fails to mention the connection of Hall’s War to A Breach, despite that connection having been explicitly made in the 1876 exhibition catalogue. War is listed there as “Breach in the City Wall: Morning After the Battle. Water colour. No. 5 in Catalogue, ‘Gilchrist’s Life.’ Exhibited at the Royal Exhibition, 1784” (entry 185). In 1863, Rossetti was unaware of the Ackland Breach altogether. This version, the only one titled by Blake, was then owned by Alfred Aspland, whose extensive collection of Blake watercolors and drawings was then unknown to Rossetti. Aspland lent his version to the 1876 Burlington Fine Arts Club exhibition, where it was described as “A Breach in the City: The Morning After the Battle. Water colour. This title is written on it by Blake, with the date apparently of 1780. This drawing, or another with the same title, was exhibited in 1784. See No. 5 in Catalogue, ‘Gilchrist’s Life’” (entry 157). The Burlington title differs slightly from the inscription on the watercolor itself, which reads, “A Breach in A City the Morning / after the Battle / W Blake inv & d.” The supposed date of “1780” is a misreading of “inv & d,” one recorded by Rossetti in 1880 (208, #5). The ampersand—if that is what it is—is completely indistinct (illus. 8). Nor are there periods after it, “inv,” and “W” (pace Robertson 175), or after “inv” and “&” (pace Butlin 191, Pressley 138). In his revised 1880 lists, Rossetti records the Aspland/Ackland version at the end of the entry for the Carnegie version (208, #5), but he fails to indicate which version was exhibited in 1784. Aspland’s version was acquired in 1904 by W. Graham Robertson, who reproduced it in his 1907 edition of Gilchrist’s Life as the one exhibited (1: 54). It is so identified in his Blake Catalogue of 1952 (175-77, pl. 56), and his view was apparently shared by Kerrison Preston—who edited the catalogue and acquired the work in 1961, a year before it went to the Ackland Museum—and shared by Anthony Blunt as well (11n27, pl. 8b). These owners and critics do not sequence the early versions of A Breach or pair them with versions of Pestilence, nor do they explain their reasons for choosing the Ackland Breach as the one exhibited.6↤ 6 In Robertson’s catalogue, the Fogg and Carnegie versions are conflated; the latter is described with the former’s measurements and provenance (176-77). Apparently, they believe their choice is self-evident, probably because the inscription suggests as much, since it is the title by which the work is identified in the Royal Academy catalogue. At any rate, they clearly do not find the style of the Ackland Breach to be inconsistent with Blake’s pen and wash style of the mid-1780s. 1. A Breach in a City the Morning after the Battle, c. 1784. Pen and watercolor (29.7 × 46.3 cm.). Museum of Art, Carnegie Institute, Pittsburgh. Carnegie version before the Ackland is certainly correct, but not because the Carnegie is more detailed and carefully executed than the subsequent version. The same stylistic features characterize revisions or second versions of other works, while relaxed handling may reflect an artist’s first thoughts on a subject. Indeed, the Carnegie’s companion piece, the Bateson version of Pestilence (illus. 13), is sketchier and was shown less care than the subsequent Bristol version (illus. 14). While an increase or decrease in detail does not reliably mark sequence, changes between versions that are also corrections do. For example, in the bottom left corner of the Carnegie version (illus. 1), the right foot of the soldier crosses the line forming the arm of another soldier, rendering the foot transparent. In the Ackland version (illus. 2), Blake corrected this mistake by repositioning the arm. The hand retains its original gesture, but instead of grasping a strap that appears connected to a shield, contrary to the manner in which the bottom shield is held, it now grasps either the hilt of a sword or the top (and wrong end) of a banner. 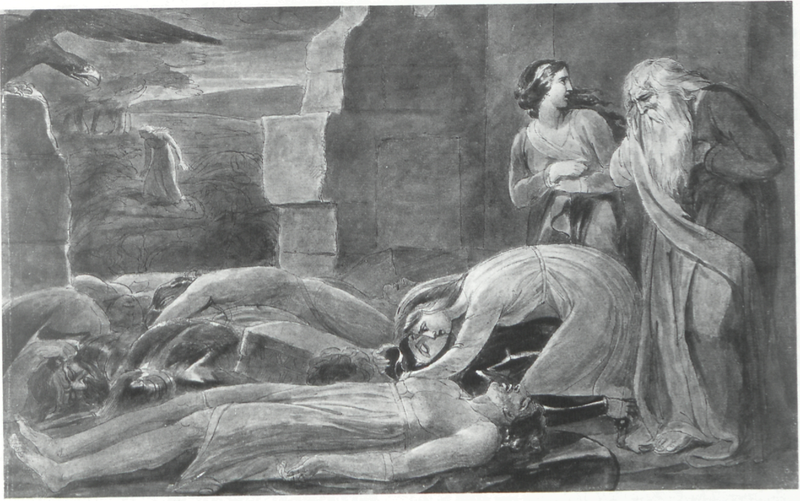 The figure to the right, outstretched in the breached wall, is solidly on top of bodies in the Ackland version, whereas in the Carnegie version this figure is tentatively drawn over and through a curved line that apparently was meant to suggest a shield rather than the figure’s chest or robe. The high-arching back of the mourning woman was repeated in the Ackland version but then erased and lowered, while her long neck was shortened, making her proportions more realistic. Perhaps the most significant alteration was the addition of the old man’s crutches in the Ackland version, though traces of them are visible in the Carnegie, where the right one goes only as high as the sash and the left one seems to have been made of glass, passing through a hand (illus. 1). Blake apparently added the crutches after he had drawn the hand—that is, he decided to add them only after the composition had been designed and drawn in ink. Initially, the hand may have grasped the hilt of a sword, pole, or spear, which in turn may have suggested the idea of crutches, an idea developed in the second version. 2. A Breach in a City the Morning after the Battle, c. 1784. Pen and watercolor (32.9 × 47.9 cm.). Ackland Art Museum, University of North Carolina at Chapel Hill. that the Carnegie version is unfinished. Not only are the crutches incomplete, but the old man’s robe, painted blue above the sash, was left uncolored below and to the left of the sash. Such an assumption also ignores the very weak blocking of the Carnegie design. For example, the breach is so crowded with bodies and armor that it lacks visual and thematic focus, expressing the effect of war on a city’s defenses, instead of the horrors of war per se. By removing the shield at the far left and the soldier left of the casket, Blake shows more of the wall and, more significantly, more of the soldier outside the wall. This soldier, lost among bodies in the Carnegie version, is now distinct with highlighted chest and face, representing the numerous but face-less dead behind him and the wall. 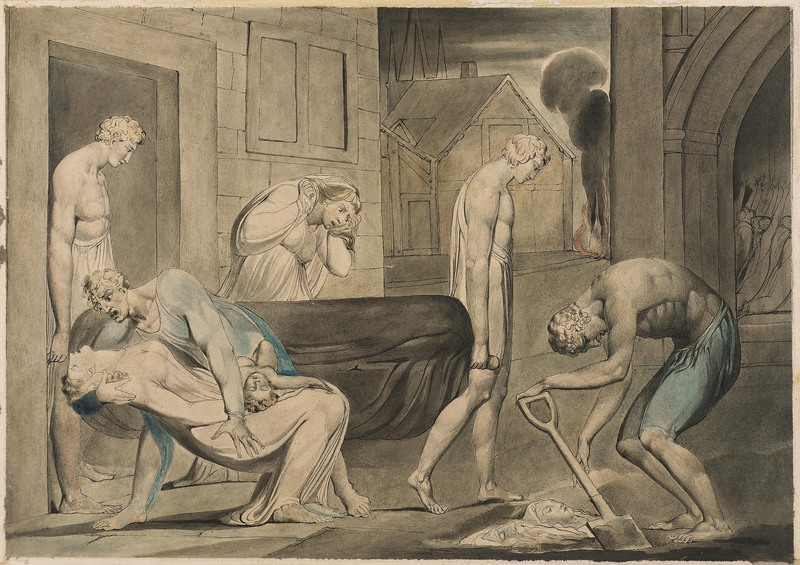 By simplifying the configuration of bodies at the breach and giving the distant dead a face, Blake expresses more clearly the theme that “War” is the fountain of “bitter Death & of corroding Hell / Till Brotherhood is changd into a Curse” (Milton 35: 3-4). This theme is far more overt in the 1805 version (illus. 3), where the “enemy” dead, rather than being dehumanized, are delineated as carefully as those lying inside the walls. The top figure appears collapsed in despair over his comrades rather than one of the dead; embracing two of them, he is analogous to the woman mourning her lover. In the Ackland version, the two camps are not yet so neatly parallel, but they are moving in that direction, as is suggested by the woman in the killing fields. Like the figures standing beside the wall, she witnesses the carnage, but the sympathy she elicits is due more to her moving cautiously and looking apprehensively, gestures of fear suggested by her dramatically outstretched hands and, most significantly, her wide open eye. Both gestures are missing in the Carnegie version, where she is drawn less expressively and has no eye at all. The removal of the soldier left of the casket also reveals that the Ackland version is moving toward paralleling the warring camps. This middle soldier, with the awkwardly formed armor, is replaced by even clearer symbols of war: a spear—enlarged dramatically, relative to the Carnegie version—and a banner. Implements that are thrust upward in military gallantry lie fallen and futile. The addition of the infant and crutches in the Ackland version also infuse the overall situation, rather than the breached wall, with horror, implying that everyone, from newborns to mothers, soldiers, and aged, is equally affected by war. The Ackland version is simpler, but it is not simplistic. Blake’s changes, generated by aesthetic and technical needs, resulted in a more focused, powerful, and expressive work. 3. War, 1805. Pen, pencil, and watercolor (29.8 × 38.7 cm.). Fogg Art Museum, Harvard University, Cambridge, Massachusetts. exhibited, based entirely on the premises that it is more carefully executed than the Ackland version and that care reflects Blake’s intention to exhibit, is unconvincing. I suspect that Blake executed the Carnegie version first, recognized his various mistakes while washing the design, and proceeded immediately to produce a second, revised version, which he inscribed most likely with an eye to exhibition. Blake chose to repeat the composition on wove paper instead of laid—the support he used for the Carnegie version—which also suggests that he intended to exhibit the new and corrected version of his design, since the wove, the heavier and more expensive paper, took dark washes better, and since the three extant watercolors Blake exhibited at the Royal Academy in 1785 were also executed on wove paper.8↤ 8 Three of Blake’s exhibited works in the 1780s are untraced: Death of Earl Godwin, War Unchained, and The Bard (Butlin 60, 187, 160). 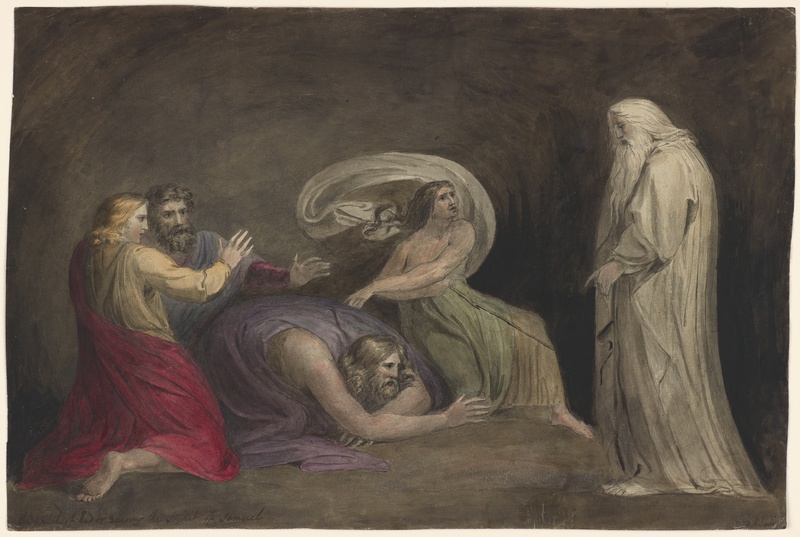 But the three watercolors of Joseph and his Brethren, exhibited in 1785, are on wove paper and, like the Ackland Breach, trimmed to the image, which was routinely required of drawings exhibited (see Essick, “Blake’s 1812 Exhibition,” 36). This scenario, however, differs completely from the one Martin Butlin proposes. Butlin believes Cummings’s sequence but believes also that both versions of A Breach are too “accomplished” for 1784, that both were produced in the 1790s, possibly five to 10 years apart, and that the exhibited version is lost. The Carnegie version, he argues, “seems rather too advanced for the work exhibited in 1784, being somewhat freer and more accomplished than that of the illustrations to Tiriel of c. 1789, to which it is otherwise fairly close. It is probably the companion to the Bateson collection Pestilence of the early 1790s” (189). Butlin dates the Carnegie and Bateson works c. 1790-95. He concedes that the Ackland Breach “has sometimes been confused with that exhibited at the Royal Academy in 1784,” but he notes that its “style is somewhat more relaxed: for instance the head of the standing woman on the right is no longer in strict, classical profile” (193). He dates the Ackland version c. 1795-1800. If the Carnegie and Ackland versions appear more accomplished than the Tiriel illustrations—which neither does to me—it may be because they are nearly twice their size (which accounts for their handling “being somewhat freer”) and were executed as autonomous works, whereas the illustrations have some of the stiffness characteristic of designs executed to be engraved, in which washes are laid in precisely to facilitate the engraver’s effort to translate them into linear codes. The “early 1790s” date for the Bateson Pestilence, with which the Carnegie Breach is linked, is itself suspect. It is based on two premises: first, begin page 49 | ↑ back to top that the Bateson version stylistically resembles the pen and wash drawing, The House of Death, and second, that this drawing is c. 1790 (Butlin 190, 259). But the second premise is based on its style appearing to be “a later development of the style and technique of the pen and wash drawings of the 1780s,” a set of drawings that excludes all versions of A Breach and Pestilence (Butlin 259). The logic, in other words, is circular. Moreover, the c. 1790 date of The House of Death is relative to that of The Good and Evil Angels, a watercolor dated c. 1793-94 because it follows plate 4 of The Marriage of Heaven and Hell, which is supposedly 1790-93 (Butlin 257; Bentley, Blake Books 285). House is clearly before Angels, and Angels seems easy enough to date; the problem is that Angels could be as early as 1790, because that is most likely the end date for Marriage (Viscomi, Idea chap. 26). If the sequence and spacing hold—and I believe they do—then House dates from the mid-1780s. The dates for the Carnegie and Ackland versions of A Breach are in part derived from those of their pendants, the Bateson and Bristol versions of Pestilence (illus. 13, 14). It is probably true that the paired works share the same date. However, if one version of Pestilence was executed before 1790 then both were, for they were executed very close to one another, and not five to 10 years apart. The Bateson version, which is certainly not as accomplished as the Tiriel illustrations, is sketchier than the Bristol version, with the gravedigger’s face redrawn so that the chin rests on the chest, an alteration retained in the Bristol. Other than this difference, they are exceedingly close compositionally and stylistically. In both versions, the hair color of the two women is yellow, the hair on three of the men is orangish-brown, the skirts of the front pallbearer and gravedigger are orange and yellow respectively, and the background wash is a yellowish grey.9↤ 9 In Butlin’s color reproduction of the Bateson Pestilence (189), the background wash is pinkish, which makes the washes of the two works seem less similar than they are. Given that both versions are essentially monochromatic wash drawings with touches of color, the same palette and placing of colors strongly suggest that the first and second versions were executed and finished very near to one other. Had there been years between versions, one would expect differences as pronounced as those between the second and third versions. Indeed, such differences in coloring and/or design mark all versions of works reproduced a year or more after the first, even when the new versions were modeled closely on the original composition. Compare, for example, the second versions of Paradise Lost, Comus, House of Death, God Judging Adam, and Good and Evil Angels (Butlin 536, 528, 320, 294, 323) with their models (Butlin 529, 527, 259, 257, 258). Copies of illuminated books from different editions also show pronounced differences, whereas copies from the same edition—say, Songs of Innocence copies B and E—are exceedingly similar, sharing the same palette and coloring style and differing only in the placement of some colors (see Viscomi, Idea chap. 14).10↤ 10 The works commisioned by Linnell, like the Wise and Foolish Virgins, c. 1822, the three Paradise Lost designs, and The Book of Job (Butlin 479, 537, 551), may seem like exceptions because they repeat the original (or previously executed) compositions so exactly (Butlin 478, 536, 550). The repetition results from Blake’s working from tracings of the originals and reflects the purpose of the commissions, which presumably was to keep as close as possible to the works that generated the commissions in the first place. Even when the composition remained the same, however, the coloring and highlights differed, sometimes radically, as they did in the Linnell versions. The subtle and not-so-subtle changes made among versions of the same work, even from tracings and from impressions from the same illuminated plate, reflect what Essick calls Blake’s “creative revisionism” (Language of Adam 116). 4. The Witch of Endor Raising the Spirit of Samuel, 1783. Pen and watercolor (28.3 × 42.3 cm.). New York Public Library. 4a. The Witch of Endor Raising the Spirit of Samuel, detail of inscription. 4b. The Witch of Endor Raising the Spirit of Samuel, detail of signature. sheet of paper and tracing the original’s outline with a stylus. In this latter method, though, the artist needs to press harder over the outline to transfer lines and thus subjects the original to possible defacement. When it is used, as it was to transfer a few of Blake’s designs for Wollstonecraft’s Original Stories (e.g., “Oeconomy & Self-denial”) to copper plates, the verso of the paper shows the indention of the stylus (see also Butlin 340). Such markings are absent from the second versions of Pestilence and A Breach, though the latter has a few indentions of a stylus on its face (along the eagle, wall, and reclining figures).12↤ 12 I discovered the stylus marks with the aid of a strong magnifying glass, but I found independent confirmation in The Ackland Art Museum Newsletter 16 (1984), which described A Breach as “pen and black ink, gray wash and watercolor, with traces of stylus(? ), underdrawing on off-white wove paper” (2). These indentions are presumably from the pencil or stylus used to calk the outline from the tracing. The pinholes in the top right and left corners of the Ackland Breach support this hypothesis, for tracings were often fastened to the new sheet by pins. The only marked difference between the two versions of Pestilence is that the faces of two figures were changed from profile to three-quarter view; the same repositioning of heads also differentiates the two versions of A Breach and partly accounts for why this design’s first and second versions are paired with those of Pestilence. But three-quarter views are not why the second versions are second. In both designs, Blake appears to have repositioned heads and gazes for dramatic effect and to diversify the pictorial plane. Technically and aesthetically, he did nothing he hadn’t done earlier and as well. Indeed, in The Witch of Endor Raising the Spirit of Samuel (illus. 4; Butlin 144), which Blake signed and dated 1783, the faces alternate between profile and three-quarter, much as they do in the Bristol Pestilence. Josephbegin page 51 | ↑ back to topOrdering Simeon to Be Bound (Butlin 156), which Blake exhibited in 1785, also shows a deliberately diverse range of facial positions. This latter work is especially telling, for it is based on a sketch (Butlin 158) in which two of the three-quarter faces are profiles and one of the profiles is three-quarter. The sketch and finished drawing were executed near one another in time, and the changes between them are analogous to those found in the first and second versions of A Breach and Pestilence. Three-quarter views signify neither special accomplishment nor an advanced drawing style, nor do repositioned heads signify years between versions. The Ackland Breach is, indeed, more “relaxed” and even sketchier than it appears in Butlin’s atrocious color reproduction, probably the worst in his magnificent catalogue. The original in Chapel Hill is not muddy, as it is in the reproduction, nor is it as dark and pinkish.13↤ 13 According to Martin Butlin, the fault for the reproduction lies entirely with the poor transparency that the Ackland sent to Yale University Press, the catalogue’s publisher. The bodies in the killing fields beyond the breached wall, for example, are mere circles and arched lines (illus. 5), but so are those in the Carnegie version. 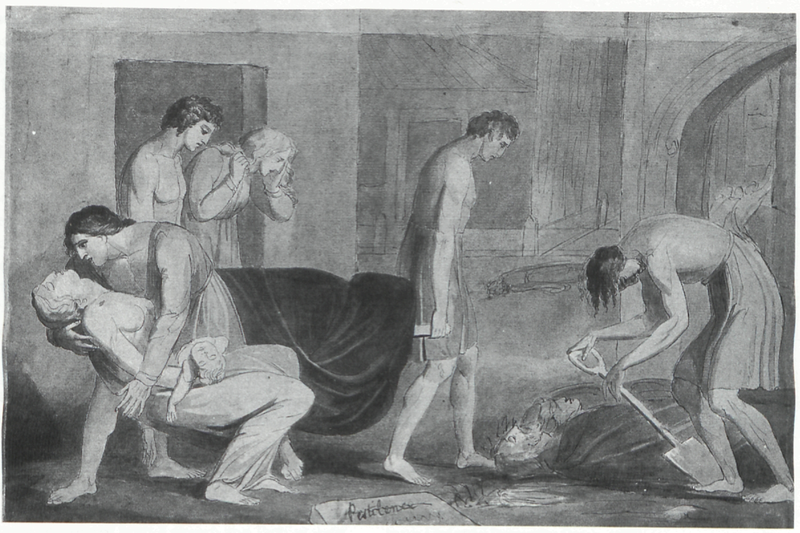 Technically, the Ackland version lies somewhere between a pen and wash and a watercolor drawing; it is monochromatic except for traces of pink in the old man’s robe, the dead woman’s wrap, the arm of the soldier at the far left, and yellowish-brown hair in the three right figures. It is more relaxed and less advanced than the Tiriel drawings and even the illustrations of Joseph (Butlin 155-57), and certainly less sophisticatedly painted or “accomplished” than color-print drawings and the illustrations to Night Thoughts and Gray’s “Poems,” with which its c. 1795-1800 date associates it. Indeed, its coloring is less sophisticated than that of the large-paper copies of illuminated books or Songs copies I, J, L, N, and O, all of which were produced and colored c. 1794-95—before the illustrations to the Night Thoughts and Gray’s “Poems.”14↤ 14 For the dates and coloring styles of these last sets of illuminated books, see Viscomi, Idea chap. 30. Because many of the large-paper copies of illuminated books and copies of Songs had been misdated post-1800, Blake’s development as a colorist seemed erratic and his work as a painter and printmaker appeared disconnected. Hence, his period styles seemed either indeterminate or inconsistent. When these copies of illuminated books are perceived as the work of the mid-1790s, however, they reveal that Blake’s coloring style for drawings and relief prints was consistent. They also reveal that the Ackland Breach was executed in an earlier period, more in the style of works like The Witch of Endor (illus. 4) and The Spirit of a Just Man Newly Departed Appearing to His Mourning Family (Butlin 135), works executed by the mid-1780s. The second versions of both A Breach and Pestilence are tied technically to the first versions and resemble them stylistically. 5. A Breach in a City the Morning after the Battle, c. 1784. Pen and watercolor; detail of breached wall. Ackland Art Museum, University of North Carolina at Chapel Hill. There are no good reasons to believe that they were executed five to 10 years after the first. What would have motivated Blake to return to these works at that time? Why work from a tracing instead of freehand, which provides far greater freedom to rethink the design, as evinced in the third versions of both Pestilence and A Breach? More importantly, why would he duplicate the minimalist coloring in or after 1795, when he employed an enriched palette and coloring style in his other works? Returning years later to an earlier style of execution seems implausible;[e] conversely, the similarity in style suggests that Blake returned to the works while they were still fresh in mind. The aesthetic quality of the first version of A Breach may have provided the motivation to revise the composition. 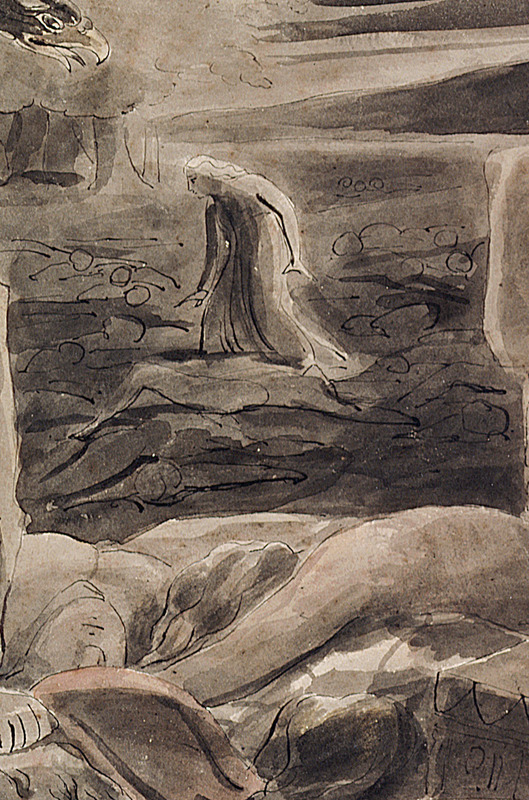 The incompletely colored robe in the Carnegie Breach suggests that Blake stopped before finishing, presumably having already decided to redraw it instead of erasing lines and figures. This decision probably influenced the one to redraw Pestilence as well, creating the second pair. As noted, Blunt and Robertson believe that the Ackland Breach is 1784, while Cummings and Rosenblum believe that the Carnegie version is 1784. All four were probably correct. 6. War, 1805. Pen, pencil, and watercolor; detail. Fogg Art Museum, Harvard University, Cambridge, Massachusetts. 7. The Island in the Moon, page 7, c. 1784. Pen and ink (30.8 × 18.5 cm. ); detail. Fitzwilliam Museum of Art. 8. A Breach in a City the Morning after the Battle, c. 1784. Pen and watercolor; detail of signature. Ackland Art Museum, University of North Carolina at Chapel Hill. 9. Pestilence, c. 1784. Pen and watercolor; detail of signature. City of Bristol Museum and Art Gallery. 1795 and 1805. The questions to ask of both works, then, are these: are the signatures really like the monogram? Were the works signed when produced, or were they signed afterward? Blake’s monogram was formed by a stylized italic W and B. The top and bottom loops of the B were formed by round strokes. The swash tail circles over both initials to connect to the left serif of the W, and “inv” was placed inside the loop (illus. 6).17↤ 17 Sometimes the B’s swash tail circled to the “i” of “inv” (Butlin 440) or to the “v” of “inv” (Butlin 450). On three color-print drawings possibly pulled in 1795, Blake incised “Blake” (Butlin 316, 310, 291), though not necessarily at the time of the pulls. Starting with the serif on the W, the two initials were written in one continuous gesture of up and down strokes, with the tips of the W’s right leg and the B’s stem connected. In the signature of the Ackland version, the B of “Battle” and “Blake” were formed alike but different from the monogram’s B; the top loop is much smaller than the bottom and is formed by a downward rather than curved stroke. The same style of B is present in the signature of The Witch of Endor (illus. 4b), dated by Blake 1783, and throughout The Island in the Moon c. 1784 manuscript (illus. 7; see “Beneath” in line 3).18↤ 18 Butlin records the signature on The Witch of Endor as “1783 W Blake inv” (144), which is how it was initially written, with a long trailing serif on the “v.” But the signature has been slightly damaged and is now difficult to make out completely. In the photograph (illus. 4b), it unfortunately appears to read “1723 W Blake.” The flag emanating from the top of the B and connecting it to the W is still visible. This kind of connection between capital Ws and the following letter was typical of Blake’s hand (see Blake’s Island in the Moon manuscript or Notebook). A similar but more pronounced kind of connection is made between the W and B in the five “Fresco W Blake inv” signatures (Butlin 295, 299, 307, 317, 326). Furthermore, the Ackland’s W differs from the monogram’s in that it has no left upward serif and is separate from the B. The form of just one part of the Ackland signature resembles the monogram, and then only superficially and inadvertently. The stem of the “d” loops over the “inv &” (illus. 8), creating a monogram-like feature, which in fact supports a 1780s date—or at least does not rule it out—because it is simply the style that Blake used to write his “d”s at this time, as is evinced by nearly all the “d”s in An Island in the Moon. Note that “wind” and “mind” create similar monogram-like forms (illus. 7, lines 1 and 6).19↤ 19 See also the final “d” of “departed” in the inscription of The Spirit of a Just Man Newly Departed Appearing to His Mourning Family, c. 1780-85 (Butlin 135). The resemblance to the monogram was formed inadvertently, by an ornamental flourish characteristic of Blake’s calligraphic hand. But the situation may be more complicated than that, because the loop may have been extended after the fact, as is suggested by the break in the line just above the “v” of “inv” and to the left of the dot for the “i” (illus. 8). Moreover, the ink of the indistinct ampersand and “d” is a lighter hue, and the flag-like serif of the “v” crosses instead of extends the right leg of the “v” and crosses the stem of the “d,” raising the possibility that all three forms, and not just the extension of the “d”’s loop, were added later. While the similarity of the strokes of the letters and their extensions argues against this, the possibility cannot be ruled out entirely, because Blake did alter the inscription, changing four lower-case letters to capitals. Initially, “A,” “Breach,” “A,” and “City” were not capitalized (illus. 8). If they were capitalized after 1784, then the original inscription was closer to the 1784 Royal Academy catalogue entry (#400): “A breach in a city, the morning after a battle W. Blake” (Bentley, Blake Records 28). Whether these changes were made the following day or years later may be impossible to tell, but the inscription and signature are clearly in the same ink and made by the same pen or brush, and their letter forms are perfectly consistent with those used in the 1780s and differ considerably from the signature Blake designed c. 1795. The Ackland version appears to have been signed when produced, though parts of the inscription and possibly a part of the signature may have been altered afterwards. The Bristol version of Pestilence, however, appears to have been signed after it was produced. The ink of the signature is darker and the letter strokes wider than those of the inscription (“Pestilence”) and the design itself.20↤ 20 I am grateful to Francis Greenacre, the curator at the Bristol Museum, for this information. The letter forms of this signature (illus. 9) are closer to those in the monogram than are those in the Ackland version, but they still vary. The W lacks its upward left serif but connects with the B. The “d”’s stem is not as extended, and the “inv” is formed very differently from that of the Ackland version and monogram (illus. 6). The “v” has a long winding serif like the one in the Ackland signature and, though illus. 4 does not show it, like the one in The Witch of Endor, but the “n” is misshapen[e] or redrawn. The feature of the Pestilence signature that most resembles the monogram is the B’s swash tail, but this feature also makes the signature unique.21↤ 21 The signature appears consistent with itself, yet the B and “l” of “Blake” also appear initially to have been joined, and the circling tail appears possibly to have been inserted just outside the B’s bottom loop. A line was drawn from the top of the “l” through the “k” to near the “i” of “inv.” Traces of a letter or number seem to be under the B’s top loop, possibly from a differently formed B, one like the B of “Battle” and “Blake” in the Ackland Breach, with a higher but smaller top loop and a stem to the right of the present stem. Again, whether these marks and lines signify changes or false starts, made when the signature was written or later, may be impossible to discern. It is the only signature in which the surname begins with a monogram-styled B; elsewhere, this style of B was used only for the initial. The assumption seems reasonable, then, that the form Blake either develops into the monogram or was influenced by it. In either case, it seems that Blake signed the work after it was produced, deliberately to match the form and text of the signature of its companion. 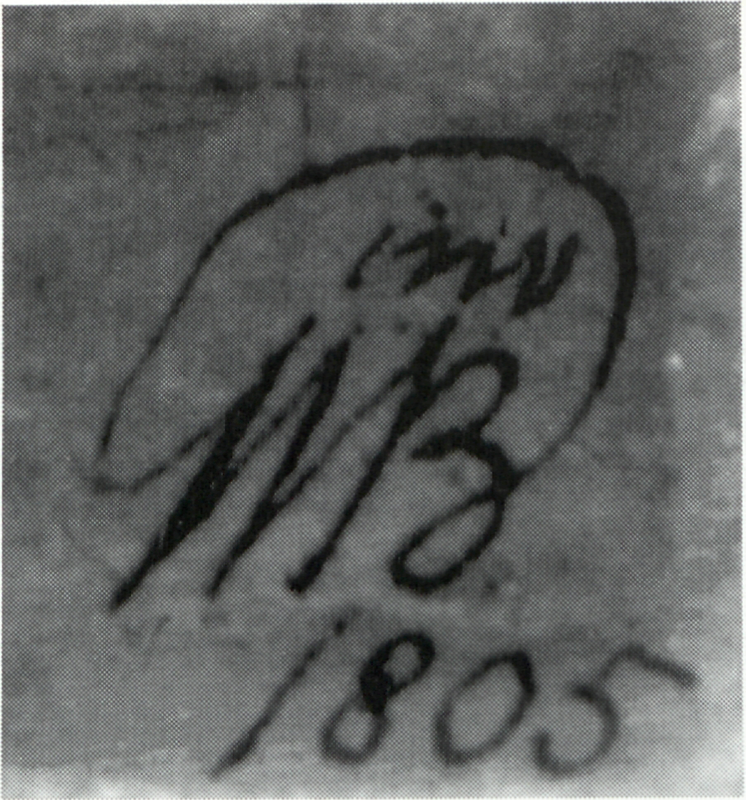 Because Blake sometimes signed and dated works years after they were produced, the possibility that the Ackland alterations and the Bristol signature itself occurred long after production cannot be ruled out.22↤ 22 The Tate impression of the color-print drawing Newton is on 1804 paper but is signed “1795 WB inv” in monogram. For an overview of Blake’s habit of signing works after production, and a bibliography, see Butlin’s “Physicality.” Dating these works by the form of their signatures must remain suspect—especially when the signatures’ texts are excluded from the dating rationale. As Butlin has demonstrated, the signatures with Blake’s surname, “WBlake 1795” and “Fresco W Blake inv” (Butlin 292, 303, 321; 295, 299, 307, 317, 326), are on color prints possibly pulled in 1795 but probably added after 1805 (Butlin, “Physicality” 8-9). These two forms of signatures are dated after 1805 precisely because they are inconsistent with the monogram in form and text, and because they appear to be variants of “WBlake inv,” which Blake began to use after 1805 (Butlin, “Physicality” 8). By the same logic, the texts of the Ackland and Bristol signatures, “W Blake inv & d” and “WBlake inv d,” place the works either before 1795 or after 1805, as does the placement of “inv” beside the surname instead of above Blake’s initials. The third version of A Breach is dated by Blake 1805 and is clearly in a later drawing and coloring style (illus. 3). A pre-1795 date is left, but this terminal date can be pushed further back. The watercolors Los and Orc and God Judging Adam, dated c. 1792-93 and 1790-93 respectively (Butlin 255, 258), are both signed “W Blake,” without “inv & d.” These, the only signed watercolors between c. 1790 and 1795, are also among the very few watercolors Blake appears to have produced during this period, which was dominated by illuminated printing and commercial engravings—and even these may be earlier than supposed. Like House of Death, they are dated relative to The Good and Bad Angels, which, as noted, is possibly as early as 1790 and not as late as 1794. In any event, their “W Blake” resembles Blake’s signature on the illuminated books from 1788 to 1795: “The Author & Printer W [or Will] Blake,” as well as his signature in the 1780s. The terminal date, then, for the signature on the Ackland Breach appears no later than 1790, but this earlier date need not be accepted by process of elimination. It is actually suggested by the inclusion and placement of “inv” in The Witch of Endor, signed “1783 W Blake inv” (illus. 4b). As noted, this work’s lower right corner is slightly damaged, and its right margin appears to have been trimmed begin page 55 | ↑ back to top after “inv,” through the “v”’s long serif (see n18). A brush or pen mark from the edge of the sheet curves over the “v” of “inv,” possibly a fragment of a looping “d” trimmed off, in which case the signature may have originally read “1783 W Blake inv [&] d,” like the Ackland and Bristol works (see n16 for a work similarly trimmed). For the Ackland Breach to have been signed when executed and the Bristol Pestilence signed afterwards would not be so strange, for it is not the signatures that make them companions. Indeed, the last version of Breach is signed and dated, but its companion, the Boston version of Pestilence, is neither signed nor dated. Moreover, Blake consistently signed finished drawings after 1795 and in forms consistent enough to discern dateable patterns, but not before. Of the 140 known drawings and sketches produced in the 1770s and 1780s (Butlin 49-190), only eight—including the Ackland Breach and Bristol Pestilence—are signed. Of these, Moses with the Tables of Stone is untraced but is reported to have been signed “W Blake 1774 [? ]” and “WB [in monogram] 1774” (Butlin 49).23↤ 23 Butlin infers the possible signatures on Moses from information supplied by the 6 April 1925 Sotheby sale catalogue (lot 153), which states that the work is “signed and dated W.B. 1774.” There is no mention of a monogram, but a near monogram in the mid-1770s is not impossible. Blake’s teacher signed his works “Basire del & sc” and “JBasire del & sc,” often combining his initials into a monogram. The presence of a signature on another is dubious (Butlin 184), and the signatures on three appear to me as possibly in a hand other than Blake’s (Butlin 119, 126, 179A).24↤ 24 The signatures are “W. Blake” (179A) and “W Blake inven” (119, 126). The bowed legs of the former’s W are especially un-Blakean, and none of the Bs matches the style used throughout The Island in the Moon manuscript. But two of the latter, Saul and David, c. 1780-85, and A Medieval Battle Scene, c. 1780, are signed “W Blake inven”; if these are Blake’s signatures, then the likelihood that A Breach and Pestilence were signed mid-1780s is further strengthened. While admittedly there are too few signed works from the 1770s and 1780s to indicate conclusively the evolution of Blake’s signature during this 20-year period, it is clear that the texts resemble one another, that all eight are variations on “W Blake inv,” and that the “d” is more likely to have been included in the signature during this period than the period in which the surname is dropped altogether and “inv” is newly positioned. In fact, no drawings signed during the period in which the monogram was regularly used (1795-1805) include both “inv” and “d” or have “inv” beside the B. It seems very unlikely, then, that Blake signed these works while using the true monogram (see n16). We can only speculate why Blake signed some works and not others, or some long after production. Probably, as Butlin suggests, sales prompted signatures (“Physicality” 8). The earliest provenances of the Ackland Breach and the Bristol Pestilence are unknown, and so the idea that the latter’s signature and its presumably deliberate echoing of the Ackland’s were instigated by sale of the two as a pair cannot be proven or disproven. 10. 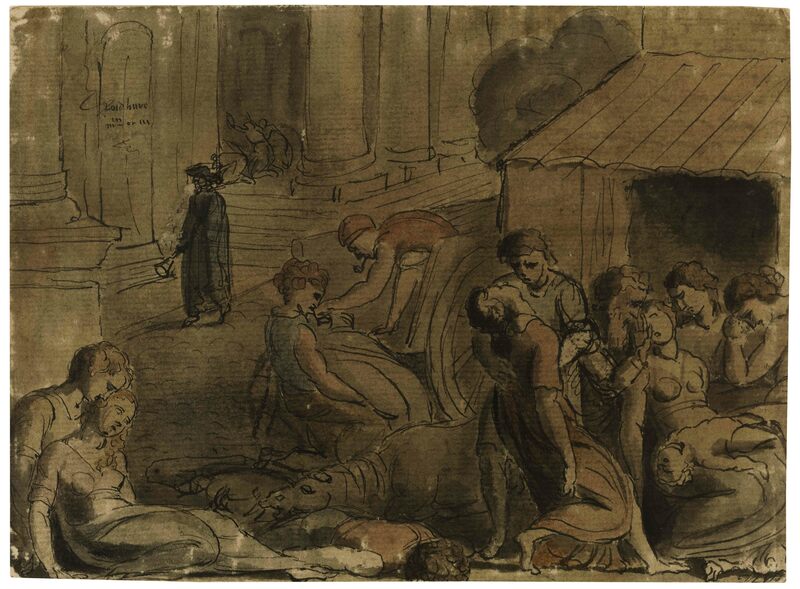 Pestilence, Probably the Great Plague of London, c. 1779-80. Pen and watercolor (13.8 × 18.6 cm.). Robert Tear Collection. to assume that he signed the Ackland version at the time of production, c. 1784. It is also reasonable to assume that the work exhibited was inscribed, for the title in the exhibition catalogue quotes nearly verbatim that inscription rather than referring to the work by subject—say War, or simply A Breach in a City Wall. Why “the morning after the battle”? Nothing in the Ackland version suggests morning or, for that matter, twilight; there is no rose or yellow in the sky. In other words, the drawing is not titled generically or by subject, as were the Joseph watercolors exhibited in 1785 (e.g., “Joseph making himself known to his brethren,” cat. no. 449; see Bentley, Blake Records 30). If the exhibited version was inscribed but is now lost, then why would the Carnegie, the subsequent version, have compositional errors but no inscription, while the Ackland, the next version, corrects these errors but has the inscription? It makes little sense to assume that the Carnegie version was modeled on an earlier version but included drawing errors and excluded its title, or that the Ackland version was executed 10 or more years later only to return to the original model’s title, despite the title’s absence in the supposed intermediate (Carnegie) version. The corrections made in the composition of the Ackland Breach indicates that it follows the Carnegie version. Inferred from the fact that heads were changed from “strict, classical profile” (Butlin 191) to three-quarter view is the hypothesis that there is a “progression” from one to the other (Essick, Works 118). Using this hypothesis, Essick places the recently discovered sketch of Pestilence (illus. 12) after instead of before the Bateson version, interpreting it as an intermediate study between the Bateson and Bristol versions (illus. 13, 14) instead of as a preliminary study for the composition itself. According to Essick, “the unfinished character of the Huntington sketch, and the hesitant and studied nature of its lines, suggest that it is Blake’s first experiment at changing some figures to three-quarter view to develop the expressive potential of their faces” (Works 118). 11. Pestilence, c. 1780-84. Pen and watercolor (18.5 × 27.5 cm.). Robert N. Essick Collection, Altadena, California. to argue that “the three-quarter turn of the female’s head in the Huntington drawing and Bristol and Boston watercolors links these works and suggests that they, in turn, follow the Bateson watercolor” (135). And, of course, the supposed c. 1790-95 date for the Bateson Pestilence (Butlin 190) implies that the sketch is mid-1790s. Precedent exists for placing a sketch between two finished versions of the same subject. The six designs of the second series of On The Morning of Christ’s Nativity, c. 1815, were radically reworked after the first series of 1809. Preliminary sketches for Descent of Peace and The Flight of Moloch are extant (Butlin 539, 541). But the material and aesthetic circumstances are completely different from those surrounding the first and second (Bateson and Bristol) versions of Pestilence. The second series of Nativity is considerably smaller, which means that the original series was not traced or calked. Technically, Blake could have squared up tracings to reduce the original images, but apparently he used the new series as an opportunity to reconceive the designs, a process which in turn required visual rethinking or sketching. These new Nativity sketches are to their first versions of the subject what the Pestilence sketch is to the earliest versions of Plague/Pestilence (illus. 10, 11)—i.e., “a complete reworking of the earlier composition” (Bennett 134). However, if the Pestilence sketch follows the Bateson version, then the situation is not analogous, for the sketch differs as slightly from the Bateson as from the Bristol version, from the design it supposedly reworks as from the design it supposedly prepares. 12. The Plague/Pestilence, c. 1784. Pencil (24.2 × 29.8 cm.). Henry E. Huntington Library and Art Gallery, San Marino, California. faces of Michael, Satan, and the other angels in the three sketches for Warring Angels: Michael Contending with Satan, c. 1780; they are variously formed in each subsequent version (Butlin 114, 115, 116). And, as noted, the sketch and watercolor of Joseph Ordering Simon to Be Bound (Butlin 158, 156) exemplify the same facility. The sketch appears to be derived from rather than leading to the Bateson version because it shares features with both the Bateson and Bristol versions. But placing the sketch between two finished designs is troubling, not only because the latter design was developed from a tracing of the former, but also because it asks us to believe the following: the mourning man’s profile is copied exactly in the sketch (illus. 12) as it is delineated in the Bateson version (illus. 13), only to be independently changed to three-quarter view in the Bristol version (illus. 14); the rear pallbearer and the mourning woman were moved to the left, relative to the Bateson version, a new position only to be ignored in the Bristol version, which repeats that of the Bateson; and the gravedigger was also repositioned, moved closer to the front pallbearer, a position ignored in the Bristol, which repeats that of the Bateson. These changes and repetitions are troubling because they indicate that Blake ignored most of his own recommendations and was able to make changes in the new version as it was being worked up and without recourse to a sketch. Why, then, would he execute a sketch? The question is not whether Blake used sketches to rethink whole designs, but whether he used them to try out minute changes in pre-existing designs. If he intended to change a few faces—or to see if a turned face would work—he did not need to redraw the entire design. Indeed, Blake’s mode of production, in both the first and second versions, encouraged revision and eliminated the need to sketch revisions on a separate sheet of paper. The first version differs from the sketch because it was redrawn freehand, a process in which the original invention continues to evolve through execution. The second version of Pestilence differs from the first, despite its development from a tracing, because the changes, like turned heads, raised arms, added or deleted figures, were made on the tracing itself, or on the new sheet of paper as the calked outline was being worked up in pencil. By transferring just the outline and not the details, artists (or engravers) leave room for revision; thus, they prevent execution from being merely an act of reproduction. 13. Pestilence, c. 1784. Pen and watercolor (31.6 × 48.1 cm.). Ackland Art Museum, University of North Carolina at Chapel Hill; loan of Lois Bateson. 14. Pestilence, c. 1784. Pen and watercolor (32.2 × 48.4 cm.). City of Bristol Museum and Art Gallery. 15. Pestilence, c. 1805. Pen and watercolor over pencil (31.2 × 43 cm.). Museum of Fine Arts, Boston. Bateson version of Pestilence sold in the same auction to Toovey (Butlin 190), a dealer with whom Rossetti apparently had no contact. As I mentioned, the sale may or may not have been Tatham’s, but the works sold were the kind that would have remained in Blake’s studio and possibly have been sold by his widow between 1827 and 1831 (see n3). 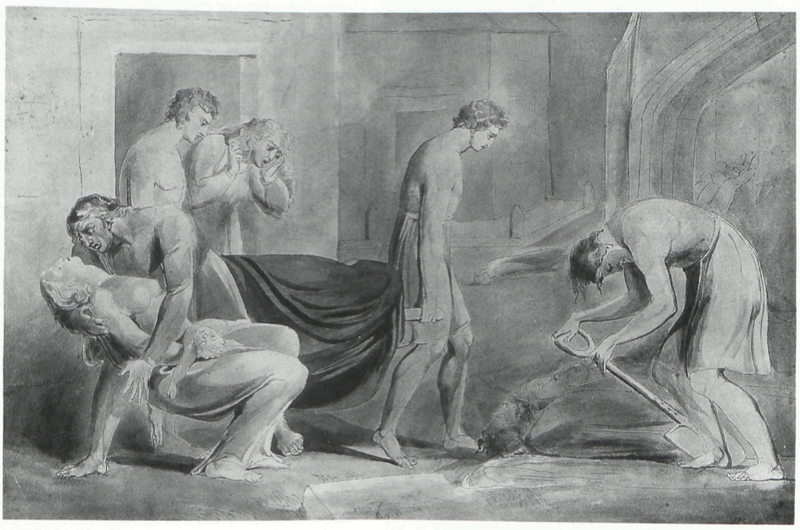 The sketch and the Bateson version, then, were most likely in the studio when Blake executed the 1805 version and probably remained till his death. The third version repeats features from the sketch and the Bateson version but hardly any from the Bristol. The face of the rear pallbearer (illus. 15) is that of the Bateson (illus. 13), but his position is that of the sketch (illus. 12); he, and the doorway behind him, have been moved from behind the man’s shoulders to behind his head, which eliminated the awkward foot beneath the woman; the mourning woman’s face is that of the sketch, but her position is that of the Bateson version; the digger returns to the position occupied in the sketch, close beside the pallbearer; the bodies being buried are again closer to the digger’s feet than to his hands and the shovel’s handle; the mourning man’s hand is again spiky, and the mourning woman is again in three-quarter view, as in the sketch. The last version contains differences as well: the digger holds the shovel with his left hand instead of his right, and the spade is in front of instead of behind his feet; the infant’s right leg is lifted, and its right arm is extended along its mother’s right leg.29↤ 29 Bennett finds that “in the Bristol and the Boston watercolors the baby’s left arm has been extended across the mother’s legs in a crucifix-like position more clearly and expressively indicating the child’s sad condition” (133). I see an extended right arm in the Boston version but no left arm at all, while in the Bristol version I see a baby formed much as he was in the sketch and first two versions, with perhaps the right arm or leg partially visible over the mother’s left knee. Only the three-quarter view of the mourning man is possibly drawn from the Bristol version, but this change, like the others, could have been drawn without reference to the Bristol, if the three-quarter view of the rear pallbearer in the sketch was once again transferred to the mourning man. To believe that the Bristol version of Pestilence (illus. 14) was executed after the Bateson (illus. 13) version is not difficult, but the reason is not that its figures are drawn in three-quarter views. To assume so requires focusing completely on parts instead of the composition as a whole. More significantly, such an assumption ignores Blake’s mode of production and the techniques that enabled him both to repeat himself and to vary his own designs while doing so. Authenticating and dating art works, long at the heart of art historical analysis, cannot be dismissed as merely the concerns of connoisseurs, beneath the notice of scholars and critics, for they are essential in establishing the visual texts studied and the chronologies that define periods. When a work is redated, our ideas of period style, technique, and media—the features that assist in dating and identifying works—are called into question. When one work is redated, nearly always others require redating as well, and even the parameters or defining features of a period or style can be altered. The earliest extant versions of A Breach and of Pestilence are a case in point. They were probably produced by 1784 and not in the 1790s. The Carnegie and Bateson versions of these works were the first executed within their groups, followed closely by the Ackland and Bristol versions. begin page 61 | ↑ back to top Both second versions are signed, and they have been dated post-1795 because the form of one part of their signatures resembles the monogram Blake began using that year. Butlin’s hypothesis that the form of Blake’s signature is dateable is probably sound, but it is helpful only in dating works produced in and after 1795, when Blake began to sign works consistently and uniformly, and not before. Moreover, in the Ackland version, the monogram-like features were inadvertently produced, while in the Bristol version they were probably made after production, though how long afterwards is probably impossible to determine. Furthermore, the texts of these signatures differ significantly from those of the mid- and latter-1790s but are similar to those of the 1780s. The new dates for the Carnegie and Ackland versions of A Breach raise the possibility that the latter version was the work exhibited in 1784. Its inscription and monochromatic wash style support this supposition and date. 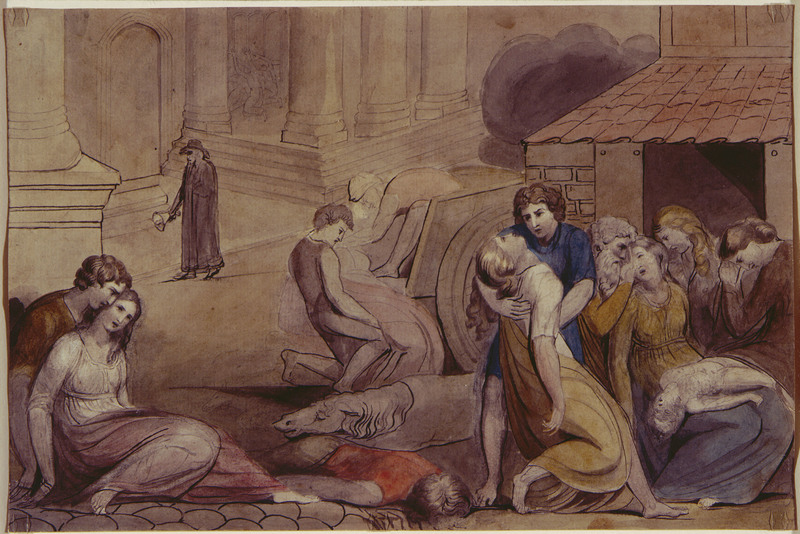 If the Ackland version is the supposedly untraced A Breach in a City the Morning after the Battle (Butlin 188), then the three extant versions of the composition were probably the only ones executed, in which case no version of A Breach is lost, and our ideas about Blake’s drawing style in the 1780s require rethinking. The second versions of both A Breach and Pestilence differ from the first by the presence of three-quarter views in place of profiles. Mistakenly inferred from this stylistic feature is a hypothesis about development in Blake’s style. This hypothesis, combined with a tendency to overlook the material facts of production, Blake’s technique of watercolor drawing, and the purpose of sketching, has led to misdating and misplacing a sketch in the evolution of Pestilence. 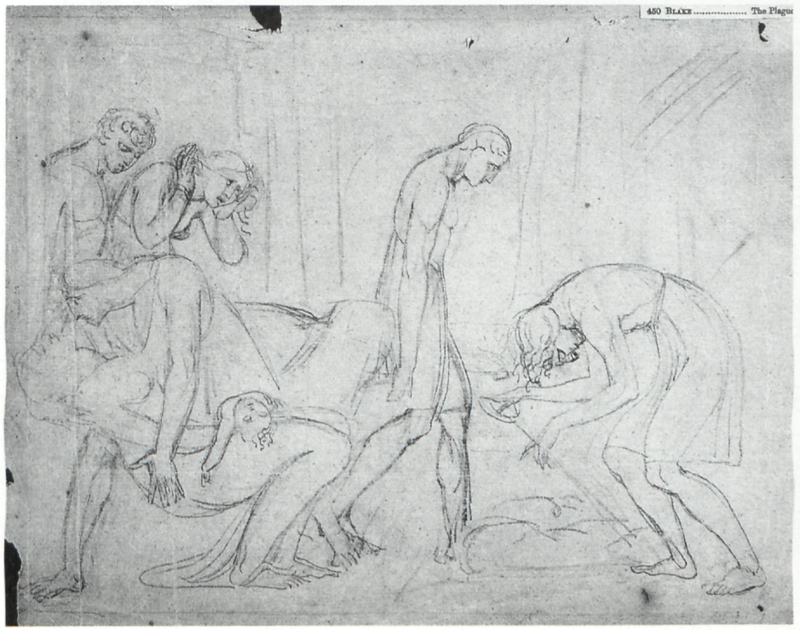 The sketch is exactly what it looks like: a preliminary study for the composition in general and for the Bateson version in particular, executed by c. 1784 and not the mid-1790s. I am not questioning the assumption that Blake’s pictorial compositions move towards greater technical and emotional complexity as they were reworked. Three-quarter views may indeed be more prevalent in later works than in earlier, more neoclassical works, but, in and of themselves, such views do not signify later production. I am questioning the tendency to assign higher evidentiary status to particular facial gestures than to a composition’s overall style, to selected visual details than to technique and production. Bennett, Shelly M. “A Newly Discovered Blake at the Huntington.” Blake/An Illustrated Quarterly 18 (1984-85): 132-39. —. Blake Records. Oxford: Clarendon Press, 1969. Blunt, Anthony. The Art of William Blake. New York: Columbia University Press, 1959. Butlin, Martin. “Footnotes on the Huntington Blakes.” Blake/An Illustrated Quarterly 22 (1988): 17-18. —. The Paintings and Drawings of William Blake. 2 vols. New Haven: Yale University Press, 1982. —. “William Rossetti’s Annotations to Gilchrist’s Life of William Blake.” Blake Newsletter 2 (1968-69): 39-40. Cummings, Frederick, and Allen Staley. Romantic Art in Britain: Paintings and Drawings, 1760-1860. Philadelphia: Philadelphia Museum of Art, 1968. Essick, Robert N. “Blake’s 1812 Exhibition.” Blake/An Illustrated Quarterly 27 (1993): 36-42. —. William Blake and the Language of Adam. Oxford: Oxford University Press, 1989. —. The Works of William Blake in the Huntington Collections. San Marino: The Huntington Library, 1985. Gilchrist, Alexander. Life of William Blake. 2 vols. London: Macmillan, 1863. —. Life of William Blake. New and Enlarged Edition. 2 vols. London: Macmillan, 1880. —. Life of William Blake. Ed. W. Graham Robertson. London: Macmillan, 1907. Pressly, Nancy L. The Fuseli Circle in Rome. New Haven: Yale Center for British Art, 1979. Robertson, Graham W. The Blake Collection of W. Graham Robertson. Ed. Kerrison Preston. London: William Blake Trust, 1952. Rosenblum, Robert. Transformations in Late Eighteenth-Century Art. Princeton: Princeton University Press, 1967. 3rd printing, 1974. Rossetti, William Michael. “Annotated Catalogue of Blake’s Pictures and Drawings.” In Gilchrist 1863, 2: 199-268. —. Rossetti Papers 1862 to 1870. London: Sands, 1903. —. “Blake and the Marketplace 1852: Thomas Butts, Jr. and Other Unknown Nineteenth-Century Blake Collectors.” Blake/An Illustrated Quarterly (forthcoming). Wittreich, Joseph Anthony. “Further Observations on William Rossetti’s Annotations to Gilchrist’s Life of Blake.” Blake Newsletter 3 (1969): 48-51.